Posted by aronzak in Dell, Linux, Netbooks, Ubuntu. 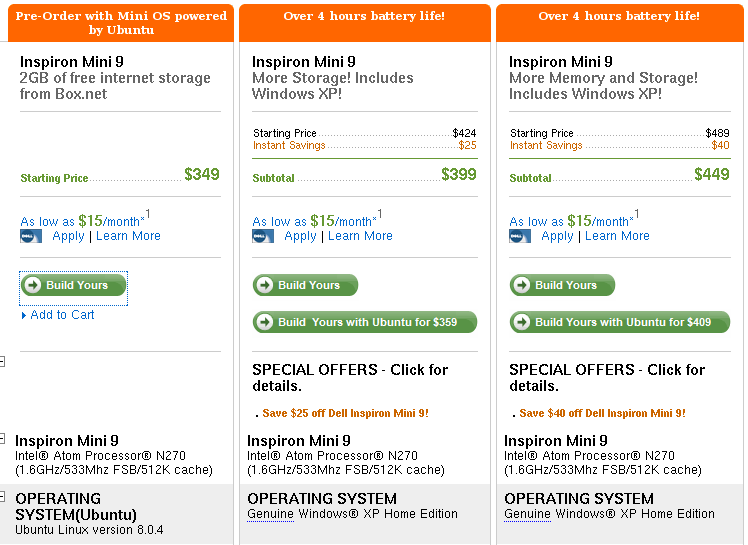 The VAR guy has an article showing an advertisement for the Dell inspiron mini 9 featuring Ubuntu, with no mention of a Windows model. Well done Dell. But I was more surprised when I saw this page. Ubuntu is not hidden. In fact, it says ‘Ubuntu’ 4 times, and gives an opetion to build each of the XP machines with Ubuntu. Dell must be confident. Posted by aronzak in Cloud Computing, Dell, Hewlett Packard, Linux, Netbooks, Suse, Vista, Windows. Despite having product details for the Suse versions up for a while, Hewlett Packard has finally decided to release its Suse enterprise version of its 2133 Mininote. But only for two versions, compared to Vista’s 6. Also of note; Dell has expanded its Ubuntu lineup by 2 computers, including a 1,200 USD XPS model. Perhaps they are getting more serious about offering Linux, putting it on not just the lowest grade hardware.